This morning, I awoke to a flat, hand addressed envelope from J Crew in my mailbox. I knew immediately that they were rejecting me, and wasn’t even going to bother opening the letter until later. Instead, my curious roommate Lyndsey ripped open the envelope and read the letter out loud. I was bummed, but eventually we both started laughing at how ridiculous the letter sounded. I wondered why the manager didn’t just call me directly, and why the company needed to send me an official rejection letter. But to be honest, I was pretty relieved to get the letter. There are a multitude of reasons why, but the biggest is that over the past two weeks, I’ve been planning a cross-country road trip with my friend Alex. Once I’m done with classes at the end of April, I have all of May & June off with nothing to do. Alex finishes finals at UPenn the first week of May, and has a month off before he starts a summer internship in Los Angeles. 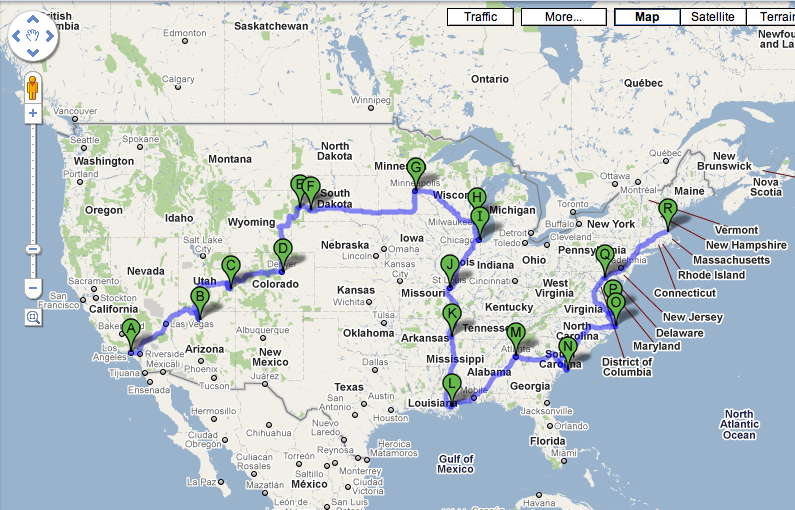 The plans for my road trip with Alex this summer! We’ve been hypothetically plotting this trip for a few years, but now we both have the time off to actually make it happen. Alex’s mom offered to let us drive her car, so we would start the trip in LA and end in Boston. I can’t stop thinking about the trip, and I’ve spent hours making maps, googling cities and adding to the itinerary and budget sheet Alex and I have created. So what does this have to do with J Crew? If they had offered me the job, I would have been tempted to take it, meaning I would be forced to be in Boston all of May & June to work. While my bank account would be much happier with me making money (although lets be honest, I’d probably spend my whole pay check on their clothes anyways) rather than spending it, just the idea of my road trip dream going out the window makes me cringe. Really, the rejection is a good thing, especially since once I start a full time co-op in July I’m not going to want to be working retail on the weekends. I am bummed, because J Crew seems like an awesome company to work for, but I think my stint in retail is over, at least for now. On the topic of jobs, I got a very disappointing email from my co-op advisor today, saying that the Globe won’t be making calls about second interviews until the end of next week. On that front, the waiting game continues. April 1, 2010. 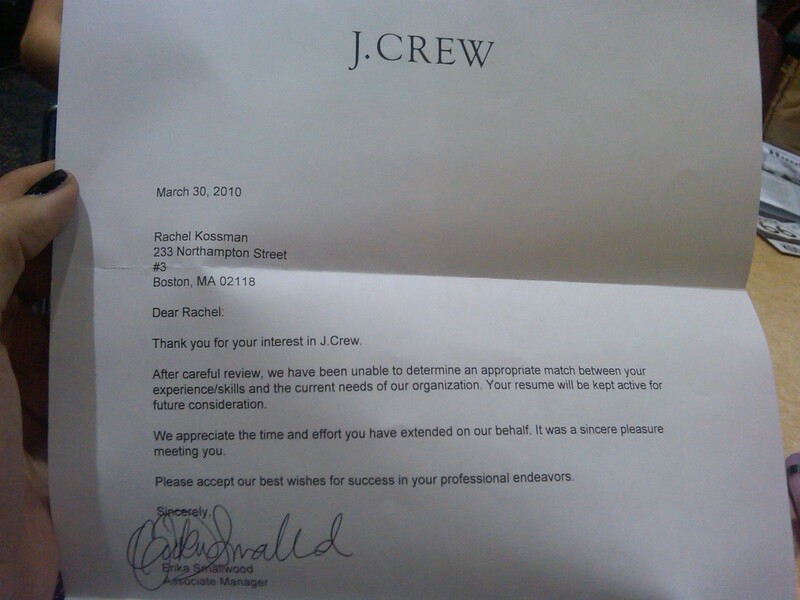 Tags: Boston Globe, co-op, Interview, j crew, rejection letter, retail, Road Trip. Uncategorized. May 5, 2010 at 6:32 pm. Permalink. It’s nice and smaller than average can easily fit in even a smaller kitchen. It comes which has a whisk attachment that is certainly great for whipped cream and egg whites. Even with the faster models compared to a regular blender, hand blenders are really quiet with the motor being completely enclosed inside handle’s casing. June 22, 2013 at 2:56 pm. Permalink. applications, cleaners of this type have a wide variety of uses. June 26, 2013 at 10:47 am. Permalink. June 27, 2013 at 11:05 am. Permalink. July 1, 2013 at 10:06 pm. Permalink. no knowledge of the words. The key is to help keep the work area neat and clean and focus on the task at hand. Some wireless systems are able to transmit full 1080p high-definition signals. July 13, 2013 at 10:46 am. Permalink. This saves you a lot of time if you’re a frequent traveler, as it prevents you from having to remove your backpack every time you go through security. Take a few of your child�s books to the store with you and load up the pack, to see if it will be comfortable. To do this I still put a large plastic bag in my backpack and pack everything in this. July 14, 2013 at 2:07 pm. Permalink. The solid nature of Casio’s G-Shock brand along with increasing functionality attracted sports enthusiasts, manual workers the ones with an adventurous streak. The famous frogman line is obtainable in a Japan yellow, Love The Sea and Earth green, now even red. This came together in the 1974 release from the Casiotron watch, our planet’s very first digital watch having an automatic calendar. July 21, 2013 at 11:17 am. Permalink. Hey there, I know it was a few years ago now and you’re probably flying high in whatever you’re doing now, but I thought if it’s any consolation I just got my rejection letter from J. Crew as well. The saddest part is seeing that they haven’t changed the style of the letter at all. Literally the exact same word for word. And that I won’t be working for such a great company. The best part of all this is that I can work for an even better company and they’ll have to see how well I’ve done in the next few years and ask themselves why they didn’t take me on. August 13, 2014 at 1:02 pm. Permalink. April 13, 2017 at 12:03 pm. Permalink.